Soft tissue distraction (STD) is an increasingly accepted operation in all fields of hand surgery from elbow contracture release to PIP joint release. 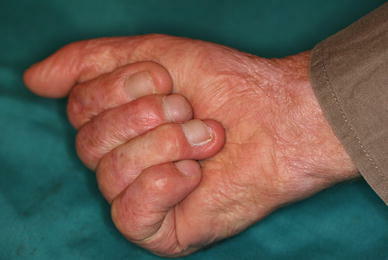 Current techniques reported lack the ability to distract the joints of the fingers or the hand, maintain the length of released contractures, and hold them in a position while active and passive physiotherapy is possible. 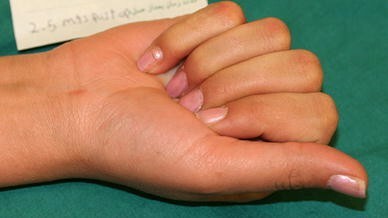 We describe a technique by which STD of the hand and fingers is done with no joint or tendon involvement overcoming the aforementioned drawbacks. Thirty-three patients with hand contractures were treated. In this method, a thin 1–1.5-mm Kirschner wire was passed horizontally at the proximal head of the distal phalanx and bent like a frame around the finger, forming a pentagonal shape for anchorage. The distal distraction was exerted at the distal phalanx. Various forms of external fixation were then used to distract a finger, several fingers, or the hand by placing tension on this frame; the distraction was either static (with a wire exerting pressure) or dynamic (using a rubber band to adjust the tension). After obtaining the desired result, the wire or rubber band was temporarily freed to commence active and passive physiotherapy. We maintained the frame for 3–6 weeks. All 33 patients were successfully treated. No major complications were encountered during the follow-up period (3–5 years). The pentagonal frame allows for effective distraction of soft tissues and joint ligaments and maintains the space needed for healing of fractures of the metacarpals and phalanges. 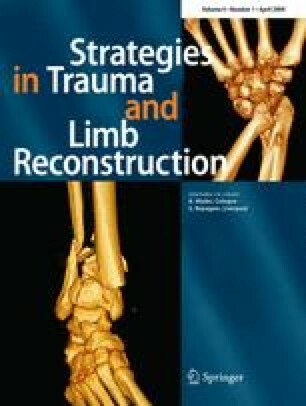 Application of distraction techniques to soft tissue contractures has been shown to be effective with minimal surgical tissue disruption [1, 2]. Soft tissue distraction for the management of radial club hand before the operation is becoming a standard in this category of patients . During the past 5 years, we have used the pentagonal frame to treat 33 patients with contractures, trauma, and even congenital anomalies of the hand. A search in the literature revealed no previous report of this technique. In this paper, we present our results using this device. Between 2002 and 2007, we performed soft tissue distraction on 33 patients aged 6 months to 51 years with a variety of hand disorders leading to contracture. 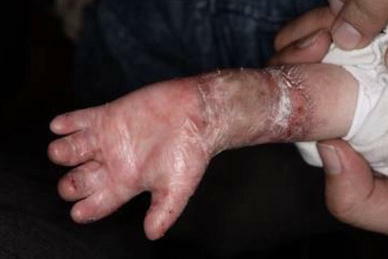 This included congenital deformities, burns, and contractures following trauma (Fig. 1). 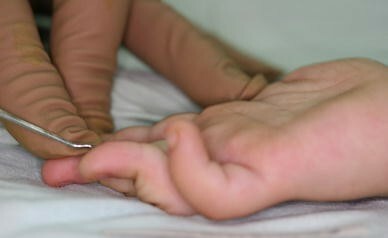 In this method, after appropriate access (multiple Z or zigzag incisions for lengthening), the contracture was released (Fig. 2). A Kirschner wire size 1–1.5 mm (matching the patient’s distal phalanx thickness) was used for anchorage. The wire was passed horizontally, under direct fluoroscopic control, through the head of the phalanx and then bent like a pentagon. Before closing the wire ends, a rubber band or wire was inserted inside the frame (Fig. 3). The frame is shaped such that only the horizontal wire segment exerts the “distraction,” and no vascular compromise or soft tissue encroachment is created. An external fixation device was then used to distract a finger, several fingers, or the entire hand (Fig. 4). After achieving the desired distraction following joint contracture release, the finger or hand was temporarily freed, and active and passive physiotherapy was started while maintaining the frame; the fingers were put back into distraction after exercise to maintain the acquired length, especially with a splint at night. The patient usually develops nearly a full range of motion (ROM) after 4 weeks (Fig. 5). The maximum result (complete flexion and extension) achieved at the end of distraction (Fig. 6) was maintained by using splints at night for up to 6 months. This prevented recurrence of contractures. There were 33 patients (23 males and 10 females) aged 6 months to 51 years (average 21.0 years). The patients underwent one to nine operations (average 3.0). The left hand was involved in 12 patients, and the right hand was involved in 17 patients. Four cases of bilateral injury were also treated. The etiology of contracture was congenital in 4 cases, industrial injuries in 15 cases, traffic accidents in 3 cases, and civilian injuries in 11 cases (Table 1). After the postoperative period when the frame was removed and the patient was discharged, the patients were followed periodically from 6 months to 5 years. The PIP joint contracture ranged from 110° to 50° of flexion contracture with a mean of 65°. The residual contracture ranged from 15° to 5° with a mean of 7° at the PIP joint level after 1 year of follow-up. The other joints had approximately the same results with a mean of 7° residual contracture. In four patients because of pin tract infection, we had to remove the frame. Usually 4 or 5 days were enough for the infection to resolve. During this time we removed the pin, and either the antibiotic dosage was increased or a combination of antibiotic regimens begun. To prevent contracture return during this interval, we continued the distraction by gluing a small hook to the nail and using a rubber band for loose but continuous distraction. No cases were resistant to distraction, and no cases of wire cutting through the bone following distraction were encountered. The only complications observed were pin-tract infection and soft tissue encroachment, which was relieved by proper antibiotics or realignment of the frame. No early or late complications concerning the distal phalanx or nail deformity of the distracted fingers were observed during the follow-up period from 3 to 5 years. Distraction is being used in all fields from maxillofacial to limb surgery [3, 4, 5, 6, 7]. Soft tissue distraction is becoming an increasingly accepted operation in all fields of hand surgery from elbow contracture release to PIP joint release, not only burn contracture release (which has been extensively reported by Joshi et al. or Suzuki) [8, 9, 10]. The idea of soft tissue distraction is not new, but the use of the distal phalanx as a distraction point and the pentagonal frame is a new addition to this field. Due to minimal complications and noninvolvement of tendinous structures, this frame can be used in all patients, be it joint contracture or epidermolysis bullosa. Active ROM exercise can begin as soon as possible without removing the frame. In the JESS system (by Dr. Joshi), you remove the frame and begin the exercises. 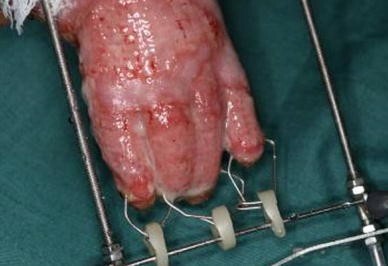 The second advantage of distal phalanx distraction is that it can be used for lengthening the fingers and metacarpals, which we shall present in another article. The techniques reported lack the ability to distract the joints of the fingers or the hand, maintain the released contractures, and hold them in a position constantly without active and passive physiotherapy. The pentagonal frame reported in this paper was used to distract the soft tissues and joints of the hand and fingers. This was done by exerting distraction on a bone without involving tendons and joints with a concomitant physiotherapy regimen made possible. 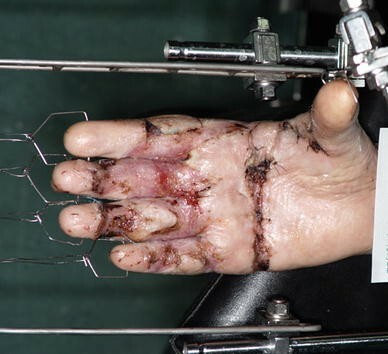 For PIP joint ankylosis due to volar plate contracture, after a healed phalangeal fracture, the volar plate is released through a volar zigzag incision, then the pentagonal frame is assembled and the finger is put under tension. Two to 3 days after surgery, physiotherapy can begin by releasing the rubber band and beginning active and passive exercises. The patient attains nearly a full range of motion (ROM) after 4 weeks. This device can also be used in congenital deformities (Fig. 7). Through volar zigzag incisions, the volar plates are released, and then the frame can be assembled and a plaster cast used to hold the fingers in extension. 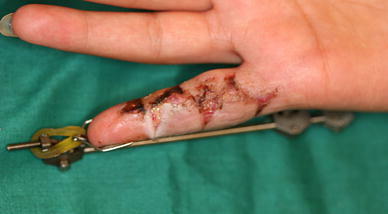 Two weeks after healing of the wounds, the fingers are in complete extension (Fig. 8). 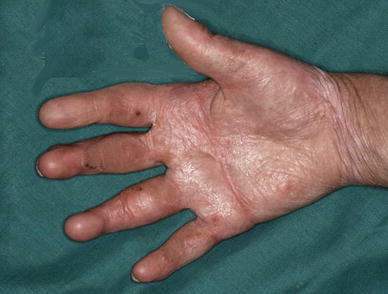 Severe volar contractures of fingers due to burns were also treated (Fig. 9). 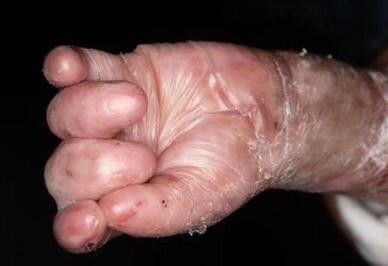 In such cases, after releasing the contractures, skin grafting, and assembling the frame, slow distraction can be started and continued until complete finger extension is obtained. During the first 4 weeks, only distraction is applied (Fig. 10). The frame may be removed after 6–8 weeks. After complete healing of the grafts, physiotherapy may be added during the next 2 weeks to increase the range of motion. After a year, the ROM of fingers is near normal and without recurrence of contractures (Figs. 11, 12). By adding a rubber component to the frame, a dynamic traction is introduced into the device, which slowly but persistently distracts the soft tissues without incidence of vascular complication to date. The pentagonal frame allows for constant traction without involvement of tendons and joints and is a useful adjunct in soft tissue distraction for contractures of the hand. Due to the lack of any serious complications, this technique is being utilized as the first line of treatment for any contracture, but especially for contracted joints, such as volar plate release or in children in whom caring for a contracture is extremely difficult by conventional means. The maximum achieved result at the end of distraction can only be maintained by night splints up to 6 months after the operation, after which it will not recur. Thus, careful follow-up is of utmost importance to keep the residual contracture as low as possible. 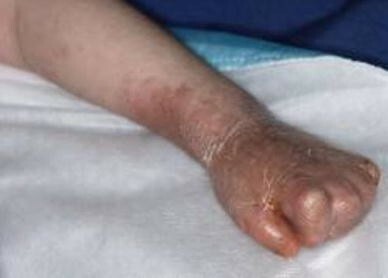 The other indication for using this method is in epidermolysis bullosa patients in whom it is impossible to use a splint due to very sensitive skin. 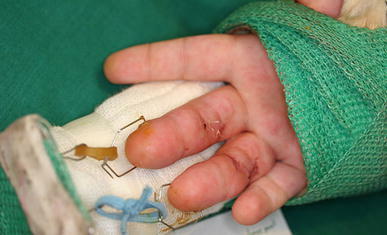 We treated a severe case of epidermolysis bullosa with severe flexion contracture and syndactyly of the fingers (Fig. 13). After releasing the contractures and putting the pentagonal frames in place, no attempt was made to separate the fingers since they were glued together by coagulum only (Fig. 14). The result after 6 months showed satisfactory extension and flexion (Figs. 15, 16). 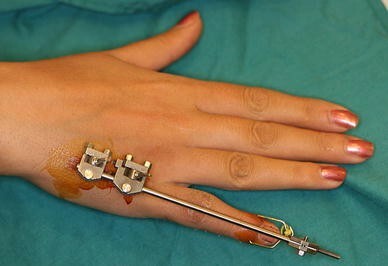 This technique differs from other methods in that it does not involve the tendinous structures like other devices do (i.e., Agee Digit Widget). As noted in this marketed device, the distraction force is in line with the schanzes inserted into the bone piercing the middle phalanx extensor tendon; it has the propensity to be pulled out if the force is increased. In our method, the distraction force is perpendicular to the pin inserted, and also because of its pentagonal design, it will exert pressure only on the bone; no soft tissue structure is involved in distraction. Thus, it can at first be used as a distraction device to slowly distract the soft tissues, and then after reaching the best possible result, active and passive physiotherapy can begin. There has been no mention of using the distal phalanx to achieve phalangeal, metacarpal, or soft tissue distraction in the literature.